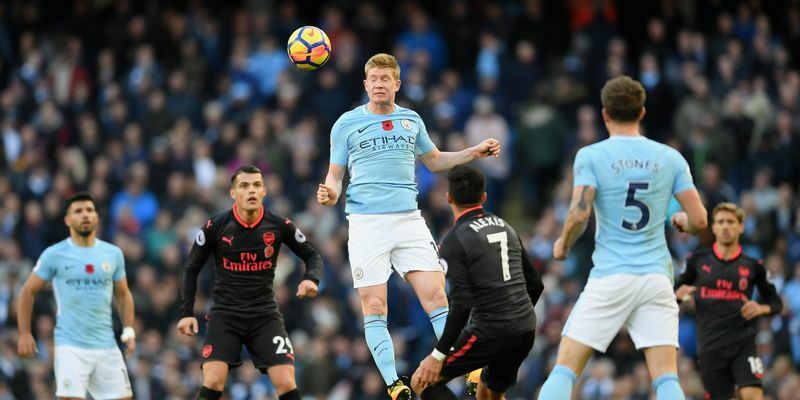 Kevin De Bruyne’s superb strike and a Sergio Aguero penalty handed City a two-goal lead within 50 minutes of the game. Although, a fine goal by the substitute Alexandre Lacazette raised hopes for Arsenal in the 65th minute of the game, it was not going to be enough for the visitors to make a comeback into the game. To add insult to the injury, Gabriel Jesus scored one more for the City side in the 74 minute of the encounter. The City has now won nine consecutive league matches which is a club record for a single season and they have progressed to the knockout stage of the Champions League and are through to the quarter-finals of the Carabao Cup. In the points table, City lead the chart with 31 points and Arsenal slip to sixth and they are 12 points behind from City. Alvaro Morata successfully escaped the attention of Manchester United's defenders to find enough space and beat goalkeeper David de Gea from Cesar Azpilicueta's cross in the 55th minute. The Spaniard, who hadn't scored in six games in all competitions leading up to the clash at Stamford Bridge, ensured that Chelsea recovered from their loss to Roma in midweek in their own way as United were handed just their second loss of the league campaign on Jose Mourinho's return to his former stomping ground. Chelsea continued to threaten in the game, while on the other hand, Mourinho's side, who had come into the clash having beaten Benfica 2-0 in the Champions League, also had a fair amount of opportunities to score but failed to convert one into a goal. After Beating Real Madrid in the Champions League on Wednesday, Spurs were almost brought crashing down to earth by a tough Palace side at Wembley. But Wilfried Zaha spurned a fabulous chance to give the Eagles the lead and it proved a costly miss as Heung-min Son’s fourth goal of the season sealed the victory for Mauricio Pochettino's side. There were two surprises exclusions in the Spurs as Dele Alli, who scored twice against Madrid, was left out due to a hamstring strain and Michel Vorm, due to replace the injured Hugo Lloris, was also missing with a knee problem.